01/05/09 ::: Traveling Man has landed! We got the good news this morning that TM has at last found his way to France! 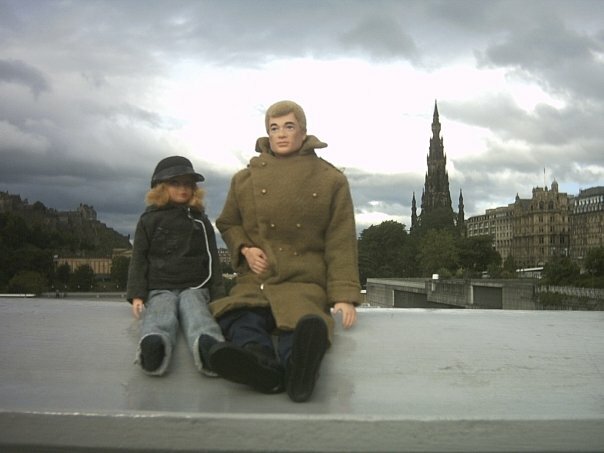 As these early pictures show, Traveling Man is making friends and hitting the pubs. We look forward to more adventures with Tesla in 2009 and we'll post the pics here!! Happy New Year, everybody! My mother is awesome. When I was little, being creative with my dollies, she never told me that I was wrong, or that I was wasting my time, and for better or worse I believed her. She encouraged me with materials and spirit, and continues to do so. Evidence most recent is this awesome Cowboy Spock that I received for Christmas. Included with Spock was a great handmade (toy-sized) sweater, some yummy home-dilled asparagus (people-sized), and a very beautiful handmade scarf for my Missus. When I look at Cowboy Spock, I become very happy. His hat is real molded leather and the feather is similarly actual. Each precise stitch and fold of his costume reminds me that my mother gave me life, options, and love. I am very lucky. 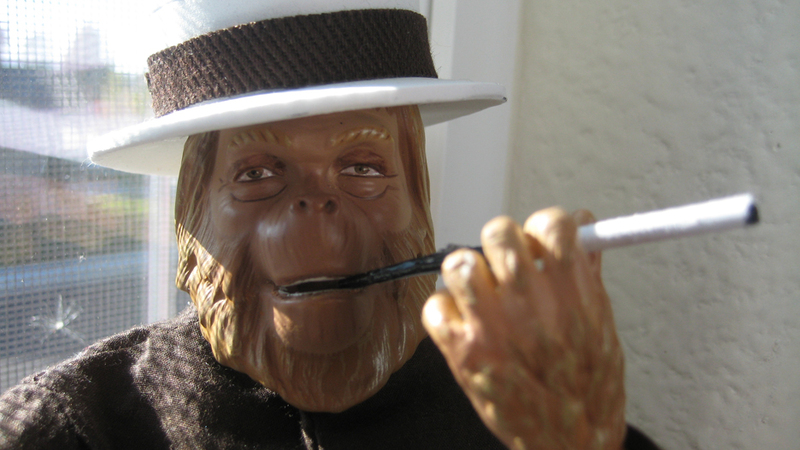 Dig this awesome shot of a kickin'-back Dr. Zaius, sent by our friend (and Small Fan) Jessica Rotich! Her ape-centric sculpting and sewing skills are out of this world, and she takes cool pictures, too. Look at the life she captured in this shot! There are great production stills out there of Kim Hunter and Maurice Evans taking smoke breaks while in full makeup during the shooting of one of the ape films. Jessica has tapped into that source material and is making really neat stuff. GO APE! Thanks for letting us post your picture! We were tickled pink last week to receive email from Tesla, a 1971 Skipper doll who lives in an amazing doll house in France. Besides the warm greetings, Tesla invited our very own Traveling Man to join her ploy-plastic family in the north of France for Christmas, including snails and champagne! 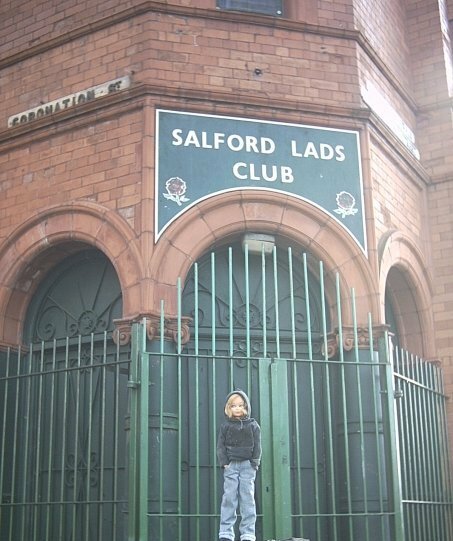 So we are sending our little man off to Europe this week, and we look forward to sharing pictures of their grand adventures as we receive them. Tesla was kind enough to send photos of her family and travels, and we have included our favorites with this post. It should be clear to all that Tesla is very much Small Like Us! As technology makes the world Smaller we are happy to note that our smiles are also getting wider. Happy Thanksgiving to everyone, in every scale! 2. Action Man likes that morning-fresh smell. 3. Serious discussion over a crate of Carlsberg. 4. Tesla and her father Mstislav. 5. 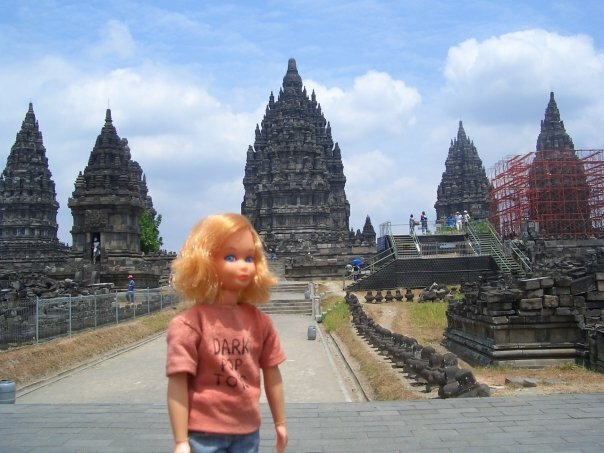 Yes, she has even been to Indonesia! 6. A beautiful photo in every way possible. 7. 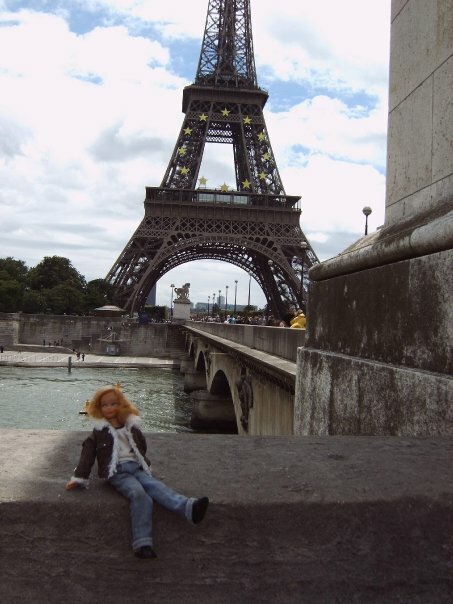 Paris; City of Love and Toys. 8. My favorite pic of the bunch. Tesla is so very hip! Last year, a few weeks before Halloween, my friend Shelly came to visit me. She said that she had a costume idea for a karaoke event and she needed one of my toys to complete things. People come to me all the time for toys like this, and is my greatest pleasure to indulge them even when I don't know the details. Now jump forward to last week, when I found a stack of photographs on my desk. These images seemed to document a singing dress-up party of gigantic proportions, and they continue to make me laugh like a laughing guy who hurts himself by laughing too much. It is with great pride, sore cheeks, and mounting side pains that I present my favorite pictures of Shelly's most outrageous night out, nearly a year ago. Lock up your tiny men, gentle readers! Queen Kong is here!! on tonight's very special episode of Blossom. Can you find the Mego in this picture? W6: The Forky Trail got itself posted this week, making a total of 264 pages of western stuff since 11/07. I don't know why those stats would be important to anyone, but let's just pretend together that they are for a moment. After W4: Grunt and Disgruntled I found that I had two pretty ok ideas for the next episode. Originally, they were both to be short segues to a larger future story, but for a while I considered running them together into a single (very chaotic) tale. The first in this duo was a fever dream inside Obadiah Dirt's beaten melon that ended up being W5: My Name Is Dirt. The other idea was a dog-pile of characters who cross paths a bunch and help to set the stage for the epic tale(s) that follows. My first vision was called "Anatomy of a Posse" (a title rejected for what may be obvious reasons) and it had maybe 20 pages, I reckoned. When I sat down to draw it out I doubled that number without batting my one good eye. In many ways, The Forky Trail defies my own formula. My two heroes spent the whole episode locked in man-cages, so not much action for the stars. There wasn't a single shot fired let alone a proper gun fight, and nobody killed a Marshal at any time during the story. And frankly, for a western, there are a lot of pirates. But I think it was all worthwhile, or I'd like to think that, anyway. I'm really happy that I have an injun character now, and it seems that I just can't bring myself to kill off Mingo. I agonized over how to present Xu and Fong's voices but I think I finally did the right thing. I was loath to discover that I had to paint some star fields at the end, having assumed I'd given that up with space adventures. I guess there is just no getting around some things. So anyway, everybody can tick the box beside W6. I already have a title for the next thing, and the concept has been there germinating since the end of Grunt and Disgruntled. W7 might be longer in the making than some of the others. I have some human real-life things to work on, so who knows when I'll get to make more amber dust. punishment by dragging through the water under the keel of a ship, either across the width or from bow to stern. A week or so ago I posted my 5th wee western thing, a short freaky installment that drives the plot almost nowhere for 30 pages. They always say, "write about what you know" so there you go. I was tickled by the idea of an episode that unfolded almost entirely in the shovel-beaten head of noted outlaw Obadiah Dirt, and I hoped that the watery blueness of cyanotypes would distinguish it from the other episodes in the series. I guess blue is my color of choice when it comes to dream sequences, judging by Agent Russell's dream in G7:e1, and by this. Here is a little tip I learned about trying to keep cut daisies looking fresh under hot photographic lights: forget it. So anyway, 5th western done and the 6th all drawn out and ready to start shooting in a week or so. I'm working on a huge secret cardboard project for a future adventure that I can't tell you anything about right now, and I also have committed myself to the idea that I need to work in some ape figures somewhere, somehow. Because a gorilla in a cowboy hat is one of the cornerstones of comedy. "By twisting the western vernacular in surprisingly compelling ways, making much of the dialog virtually inscrutable (1) and lending the characters a refreshing complexity, Dewitt has set the standard by which all toy westerns will be measured. "Who were those compañeros, anyway?" "In Grunt and Disgruntled we were delighted to see relative unknowns in key roles. The Eastwood, Wayne and Brynner action figures (2) are stars who's familiar presence would have distracted us from the intricate nuances of this gritty and exciting toy adventure. Well done DeWitt!" (3) finally, sombody in the media gets it right. UPS usually just drops stuff over our front fence in a plastic bag if we are not home, and that's how I found my Dida Display Starship Bridge Playset this week! I pre-ordered the Bridge as soon as I could, and I have been buying and saving one of each EMCE Star Trek figure in anticipation of the playset, imagining a great future day when I would open them all together and become eight years old again. Somehow, I managed to keep from busting the Klingon open... until today! The Dida playset is a jewel. The design is so simple that no instruction sheet was needed, and the materials are perfect. 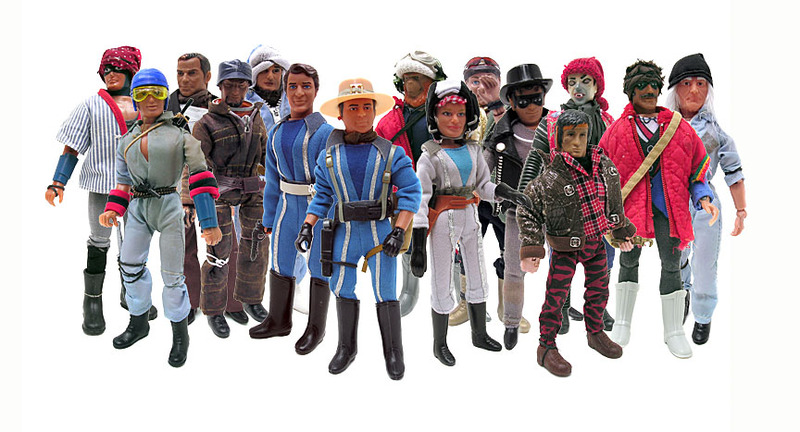 The original Mego sets were made with cardboard akin to that found on the back of a pad of paper, and sagging and bending were the norm. Dida sets are thick, sturdy, and built for warp speed. Gone are the cheap painted walls of the original Mego Enterprise set, now the crew has awesome 3D computer consoles on every wall with buttons and dials to operate! Mr. Spock would be deeply thrilled about it if he wasn't against that kind of thing. My favorite feature in the set has to be the sliding red door. Again, going way beyond what Mego did, this door is the perfect red plastic and it slides in channels that are riveted together. It even sounds like the Bridge door when you slide it open. The artwork that covers the set is luminous and vibrant, and since Scott has designed a playset that can be reversed we are treated to The Engine Room and Sick Bay sets for the first time in toy history. Each backdrop is stunning, and I hope that Scott will offer artwork sets to slip into all the groovy plastic sleeves that make up the computer monitors and Main Viewing Screen. Oh, and another thing... I have added an 18 inch clear plastic half-dome to my Dida Bridge, because you know how corrosive and debilitating that space dust can be. I just happened to have the dome kicking around here as part of an old toy space odyssey feature we used to run, and as you can see it fits like a smooth orbicular glove. I got mine here! 06/24/08 ::: Huge Win for Small Cinema! Low Plains Drifter won the award for Best Animated Film! A little strange, because it isn't technically an animated film... the still pictures slide around but they are still stills. I had to pick a category and they didn't list "slideshow toy western" as an option, so what was I to do? But I'm not complaining, no sir! I'm blushed like a boxed wine about it and can't wait to bore people with my acceptance speech. Is a white tux inappropriate for a 3:30 pm Sunday awards ceremony in July? This week I finished the 4th sepiasode in my western series. I didn't realize until it was all wrapped up that the title might actually relate to the story this time! This is entirely strange because I've had the title kicking around here unused for about five years, long before the western thing ever happened. I managed to include everything on my wish list for the 4th adventure: a stagecoach, a chain gang, another daring escape, a girl, and (a punchy ending). In between I found an interrogation chamber and a lot of dust. Like you'd expect, really. The incredibly cool prison outfits seen in this episode were handmade by Trilla LaVerve, and we can't say enough kind things in her honor. Each of those rotten criminal toys looks really great because wearesmall.com has the best staff in toy history. Three cheers for Trilla! I also must thank John Ford for the stagecoach, Jon Hendy for the deep catalog of (a certain kind of toy) parts that were critical to the ending, and Anthony B. McElveen for his dedicated service in the War on Punctuation. 06/10/08 ::: Traveling Man, again and again! Great new shots of Traveling Man have been added to TM:USA from his recent trips to Colorado, Iowa, Illinois, Indiana, Nebraska and Utah! Wow, does this toy get around or what? I also made a link list of States so you can easily see the ones we have covered and the ones we need. The dream continues - help us get a picture of Traveling Man in every State in the Union! 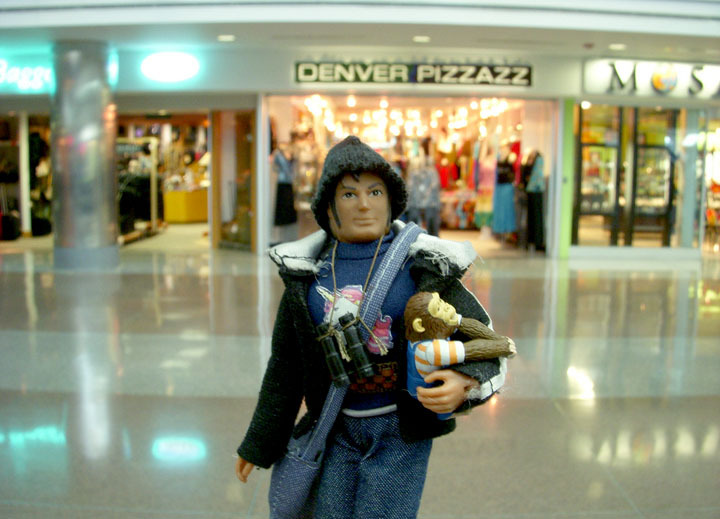 Traveling Man was seen over the weekend hunting old lady fashions at the Denver Airport. Do you know that feeling you get when you make a toy cowboy and then you print up a wanted poster of that cowboy and send it to your friend, and then he takes the poster to a famous western landmark like Tombstone, AZ and sends you pictures? Doesn't that feel awesome? Thanks, Paul!! Photos courtesy of Paul Clare and posse. Our Man in the Streets, Mr. Jon Hendy, has sent us some great new TM pictures over the last few months and I finally got around to adding them. New stuff posted in OK, TX, and AZ. Thanks Jon!! This week I finished the 3rd sepiasode in my western series. Not that the episode names have anything at all to do with the story, but this one is called, "Bury My Parts At Squeaky Knee" and it might be my favorite so far. My keen wife pointed out that it is a very dark tale... it opens with a manhunt, centers on a fist fight and near-hanging in the rain at night, and winds up underground with the shooting of a lawman, in the back. Oh, and some Chinese assassins are tacked on at the end. Good solid family fun, tell you wut. As far as production goes (read: the playing with of the toys) it was one of the best projects, ever. The cast and herd all cooperated and hit their marks like pros, and wild faith-based plunges into the technical unknown proved successful. We had authentic photography-type lights and a real dang green screen for the first time ever thanks to that neat wife I mentioned, and that was awesome. Did you know that you can buy wanted posters of Obadiah Dirt and The Stranger at cafepress.com? I want to thank Scott C. Adams of DIDA Displays for setting me on the road toward certain special effects. His suggestions are always valuable and enlightening even when I decide not to use them, and he is very kind to help me. I also want to thank that wife (the same one, see above) for her continued support in this mad toy adventure I seem to be on. So, I guess I had better sit down now and draw up the next episode. I don't know where this admittedly dark tale of woe is headed but it seems to be making excellent time getting there. There are a few definitions of the word inertia. Most people use it to mean 'static or without movement' but in physics inertia is a property of mater by which things continue in their existing state of rest or uniform motion unless that state is changed by an external force. Inertia is the thing that sends one through the windshield in a car accident. Mix in a little gravity and you get an orbit. It's cool stuff. That said, the western surge we've been on is moving ahead unabated. I'm down to a few remaining scenes left to photograph for the third sepiasode, "Bury My Parts at Squeaky Knee." And then there is all the cool cowboy stuff for sale. Also, as previously threatened we have turned the "Low Plains Drifter" pictures into a short video with cheap effects and the good nature of our friends, both of which we used mercilessly. You can see LPD: The Movie on our home page right now, or use THIS LINK. So like you know, unless some errant moon's gravity starts to screw things up, I see no solid reason why I should have to take off the Stetson and cap guns. My friend Jon has a job that takes him around the country to sort out pathetic HR problems and do moronic Sensitivity Training, and one of the offices he visits is within spitting distance (on a windy day) from our place. On those lucky occasions when he is sent to that office he comes to stay with us and we always have a great time, make lots of inane dolls, and eat steak. Our ritual for these visits has been to hunt in all the thrift stores within reach for cast-off toys that might produce fun, dump everything we find on the floor, and build as many dolls as we can eat. I have included shots of my favorite spawn from his most recent visit. Jon did not yet have a name for him when he left yesterday, so I'll just call him "Hunchy" for now. Jon's toys amaze me. He is one of the few people I know who goes through life absorbing human details for the purpose of making toys out of them, and I have to believe that this is one of the highest callings of our generation. Lots of people write in their journals, some make films or photographs or theater about what they experience, but precious few gather life data to make original custom toys. I think he is way ahead of his time and he makes me feel like a fussy scale bigot, which is a great feeling, believe me! "Hunchy" here is a knockoff toy from a hideous Disney cartoon feature about a deformed bell ringer. I don't know why anyone would want official merchandise from a film like that so I'm doubly stumped about the availability of knockoffs. It may be that they produced the toy expressly so that Jon could turn it into "Hunchy" but I have no solid evidence to support my case, only speculation and a keen sense of conspiracy. I don't know how else to explain it all and thus have decided to stop trying, and start laughing. "Hunchy" is using a WWII minesweeper to locate odd brass bits on the beach. Unashamed of his twisted self he wears only shorts and sunblock, and sports a hairstyle only a troll doll could admire. His articulation is limited but his possibilities are endless, and I think the pictures I took of him prove some of that. I feel proud to have witnessed his birthing. Jon was kind enough to keep the ball rolling on "Low Plains Drifter: The Movie" and gave voice to the Frisky Pony Saloon's Barkeep. 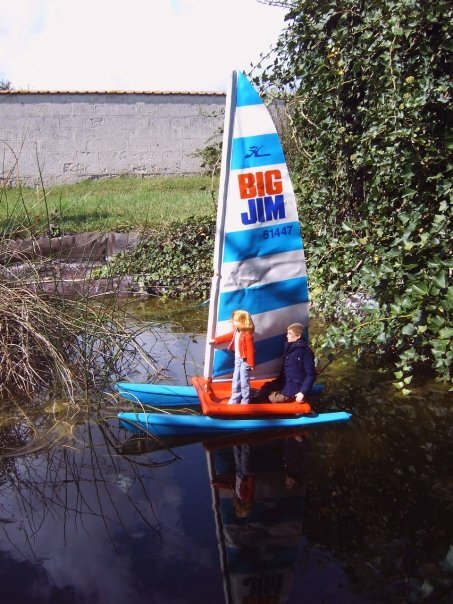 I also found his (Jon's) help indispensable when I bought a huge homemade doll house from the thrift store and discovered it wouldn't fit in my car. If anyone out there happened to film our walk across town carrying this doll house, please write. You know, maybe your cousins were on vacation in Hicksland this weekend and they videoed us by mistake; you never know. Go ask everyone, right now. Thanks!! It makes me very happy to know a guy like Jon. He's the sort of person you can respect even though he plans to move to Canada, and I'm honored to call him my friend. He also dumped a bunch of pirate parts on me so that didn't hurt, either. Honestly though, and I know I've said this before, Jon is an Evil Robot who patrols our private property in a plastic helicopter. Only our heavyweight foil bonnets protect us from his laser eye beams. 02/18/08 ::: At Long Last - Product! I've been sick for like three weeks now. Hacking, feverish, sleepless and worn out, and to take my mind off all this I ran a long wire into the bedroom so I could at least surf the interwebs during my infirmity. It was in this haze that I discovered I could start a business without any startup money. Our friend Max had been telling me for years to do this kind of thing, and I always agreed with him but never did anything about it. I've been digging through files and dreaming up Small Products to expand the line for only 48 hours but already there is fun stuff available for sale, right now! I even bought some, so I'm pretty sure it will work for you. As cool as CafePress is, I had to out-source some of my dream products. Watch this SmBlog for news on how to get your action hands on our limited edition Snow Globes and Shot Glasses! For LPD I started with the campfire scene. I used black paper for the night sky, and I cut a hole in the cardboard ground and stuck a light bulb underneath for the campfire light. I must have taken a million test shots of that camp site before I struck the set. I shot the hog farm sequence next, and spent a week or so learning how big white cards can make a stark, smudgy sky. I had this grand scheme to paint cartoon-like western backdrops on the sky cards but before I could get them done I found that I liked the blank white backgrounds, especially the way my cheapo lights made hot centers and gradient sepia smears at the edges. Something about nearly empty backgrounds behind full foregrounds just felt right, and it reminded me of High Noon. Which was all I needed, I guess. Most of the light in most of the LPD shots comes from two 1000 watt lights that I aimed directly at the white ceiling 10 feet above the set. It bounced down like a hot sun, and the addition a few well placed mini-flashlights for key lighting made for pretty ok shots with my 10.1 megapixel Casio Exilim. I shot everything in color and slapped the sepia on in Photoshop. After the hog farm I set up the town of Boxtop Hill for the street sequences. While taking test pictures I stumbled upon My Awesome Gimmick, which was to force perspective by angling the streets inward at the far end of the shot. It was a little less (or more) than realism, but it flaunted my tiny town's roof lines and popsicle stick architecture so nicely I just couldn't resist. So I made a list of all the shots "looking east" and all the shots "looking west" and had to completely take down and set up the whole town in between lists. In order to keep the buildings in consistent relation to each other I used 12 inch by 7 foot lengths of paper and traced each building's footprint, making a template for each side of the street that is buried under the sand. The effect tickled me both for its ease and its cheese, and it is probably best illustrated by two shots in FOD. On this one I decided to not used the effect so that the next shot would have the extra punch and thrill that a jail break demands. I think the results were worth the hours spent hunched over, fussing. Once all of my story board scribbles were turned into photographs, I made a slide show to watch them in sequence, repeatedly. This is when the words are formed, and this stage has always been more like dictation than writing. After posing them and taking their pictures for a few days (or forty years) my fingers just know what toys are saying, and they type out the narrative already in progress. And it was here that I discovered what a great thrill it is to type like a cowboy! I ended up using a "wide screen" format for the cinematic feel, and made 10 inch wide sepia toned .gifs for the on-line story. I played with levels a little and added cheap dust and gunfire effects, but most of what you see is what was really there on my toy table. I'd like to make a paper book out of the LPD story, and maybe slap some of that Ken Burns Effect on 'them pitchers' and make a short film, if only to give myself an excuse to compose and record my own western soundtrack. But first I want to turn out a few sequels, or at least play with these characters a little more and run their story a while. The story board for "Fistful of Dollies" is 40 images and took 90 minutes to draw. I've built a wagon for it already, and didn't even wound myself cutting out cardboard wagon wheels! Included at right are some production shots and extra views of things discussed above. Like everything else on this web site, I hope you dig them! Messing around with my camp set. That's a 45 watt camp fire! Everything was shot on this table. It's the whole dang world. Some shots of the Dirt cabin that didn't make the final cut. "Dang, you look purdy messed up!" Cheated Streets: My Awesome Gimmick! After nearly forty years of experience in the field, my method for producing Small stories is pretty simple: draw, shoot, write. I also usually have a general sort of kernel of an idea, like, "This monkey can play Martha Stewart" or, "Let's make the space toys go to war" or, "This town rejects vestibules." I don't always stick to the draw, shoot, write progression but I would say it is usually true, and yields the best results. Usually. I start with a new spiral bound notebook with lined paper and I stencil out a bunch of blank boxes that are roughly the frame proportions I want to use, usually two frames to a page because that gives me room for furious notes and fitful erasing. The LPD and FOD notebooks have a great tiger or zebra print on the cover. I'm not sure if that is important, but it's true. Then I get a fistful of #2 Ticonderoga pencils, sit under a 100 watt full spectrum Verilux lamp, and rough out each image in worse-than-stick-figure story board drawings, one after the other, as fast as I can, in the order that they come to me. I have developed a sort of sketchy shorthand for noting things like the angle of a figure's face and the direction of the light, so the drawings start very simple and get worse. I usually go back and fill out each sketch later but they are not artistic by any stretch of the imagination, and are not meant for public consumption. Which is why I have included a series of compare and contrast images with this post. Some of the dialog and other wordagings come during the drawing stage but I try to avoid getting wrapped up in text at this point and focus on action and story. Only when I think I have things visually sorted out on the pad of paper do I start taking pictures of toys based on my story board, which by this point is worn from flipping through the scenes repeatedly and from the aforementioned erasing fits. Turning manic scribbles into photographs, even in this age of technology and advanced thinking, is still a pretty tough nut to hoe sometimes. Once in a while I find that my drawing is impossible to photograph but I try to stay faithful to my ridiculous first ideas as much as possible, because I'm stubborn like that and it usually pays off. I wholeheartedly embrace the full spectrum of pleasures offered by cheap special effects, but as a rule I endeavor to take one good picture and do as little as possible to it. Very often when I'm pretty sure that I've got the shot I was after I then go hunting for another one before I strike that scene. This little ritual usually involves twisting someone's head the other direction or tossing in some unplanned set dressing or goofy camera angle or something on the fly, and I think it keeps things playful. Mostly garbage pictures, but playful. ...more on that in "Behind the Chaps" Part Four: "Boring Technical Details" which will expose many of the amateur tricks I used to make my gritty tales of sepia toyness. The first three samples of my story board sketches are all from "A Fistful of Dollies" and the last two are from a thing I did a while back called, "The New Bingo." I picked these examples because I thought each demonstrated the flow of my process to some degree. I wish I could get more specific, or understood what that meant. I know, I know... I'm in the middle of a behind-the-scenes series about the making of my first western, but I have to interrupt that and announce the release of my second western! I tried to work in everything that a proper sequel should have, and I set things up for future productions in case this becomes a huge cash cow, which could happen if the whole thing wasn't free! When I started to sketch out ideas for a toy western it immediately became apparent that I need a hog farm. There is always a farm of some type or another in a western so I figured I couldn't go wrong if I made one, and hogs just made sense. With the help of my budget analyst I decided that everything needed to be cardboard, including the ground. I kind of imagine early pioneer toys peeling great sheets of virgin cardboard up from the ground to make their first settlements, but I have no documentation to back this theory. Besides the cardboard, I used sticks gathered locally to make the hog pen and detail the farmhouse (sticks that still smell a little moldy after a bleach bath and two coats of Minwax). Note to crafters: sand mixed with white glue makes very convincing mud for any occasion! I found some great toy hogs and chickens around town, giddily blowing my entire farm budget in the process. All the hogs needed was a mud bath and they fit right in, but the chickens required serious work. They were solid plastic and their feet were built up with "natural greenery" in order to make a sturdy base for standing. I became obsessed by wanting to see light under the chickens so one evening I dremeled the leg/bases all off and replaced their legs with wire brads. Since the ground is thick cardboard I can poke the bird right into the earth where ever I need one. Now they look more like real chickens on screen and they are a snap to pose. I took some reference shots in case I needed to set up the hog farm again later (it features prominently in the sequel) and I have included some here for your general enjoyment. You all know that I don't like to toot my own horn that much, but I can say without hyperbole that mine is the most awesome toy hog farm the world has ever known. Part Two : "A Town is Born"
So, I discovered very suddenly that I love westerns! 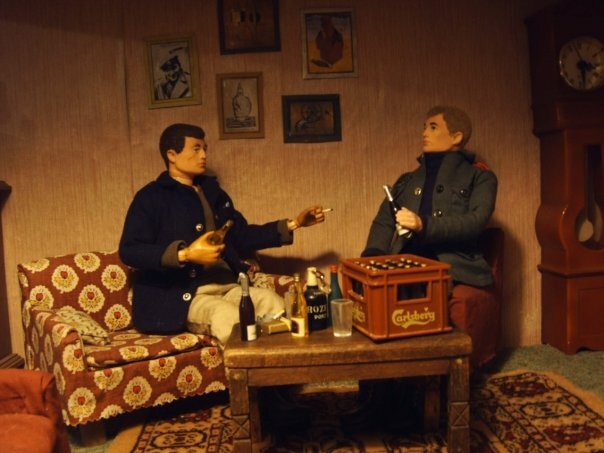 That reminded me that I had made a cardboard western saloon for Smalls just a few months previous, which was a funny thing to do for a guy who didn't care for westerns. The saloon was the result of a late night internet chat with fellow adult doll player Paul Clare, and after I proved that I could make a two-story cardboard building for Megos... I just kind of forgot about it. But the more I think on it now, the more I see that I have been on a western kick for a long time and I just didn't realize it until November '07. Besides the foreshadowing construction of the Frisky Pony Saloon, I've recently been nuts about Firefly and Serenity. I gave the hero of my '05 toy space comic G7 the nic "Cowboy," and I also found that I had a few monster toys dressed in western gear. More than a casual few, in fact, and almost all of them were raided for parts in the last few weeks. I even found that our local Actor was already dressed in buckaroo duds and, according to the Census, he had been "studying for a cowboy roll" for over two years. Coincidentally, he stars as Marshal Stack in Low Plains Drifter. But I'm getting ahead of myself by looking back. The moment I discovered that I loved westerns and had already built a saloon, I decided to go ahead and make a whole western town. I work in a cardboard-related industry so pinching quality resources was a snap. Each night I'd replay my growing stack of western movies and use my digital razor blade to cut out a new building to add to the town of Boxtop Hill. And as the town took shape it needed townsfolk. And they needed ponies. And yea, it all came to be. I did a lot of image searches for phrases like "old west" and "western town" to get an eyeful of buildings, and I developed a system of cutting and connecting cardboard walls with a slot-and-tab technology that really satisfies. In theory, each building could be deconstructed and scanned to make construction templates, although I have no plans to do so since adding all the wood trim and signage. The buildings are all open in the back for easy play and cheesy lighting. I used brown paper tape to firm up corners in some places, and thumb tacks to hold the posts in place, but otherwise the entire town is popcicle sticks and other craft wood, various grades of cardboard, and white glue. Oh, and I sprinkled play sand on the ground, for that critical western grit feeling. I made a knee-high table and dedicated a 4x7 sheet of plywood to my new town, that in a short time had a bank, barber shop, two saloons, a livery, a gun shop, a jail, a general store and even an abandoned well house. But it was the night that I cut out the Mission San Serif, knowing full well that there was not room for it in town, that I knew I had a story to tell. Part Three: "How to Make a Small Episode"
Above: Town is not yet complete but gunfights have begun! forcing perspective to show off the town. Part One : "From outta nowheres like a bullet!" or, "I Don't Care for Westerns"
It's like an illness that's fun. The signs were everywhere and I missed them. It all happened very suddenly, and it is changing everything. Those are just a few of my recent reflections on the whole new cardboard-western thing that's been going on around here. I figured before it all got too out of hand I'd try to explain what has happened for the curious, including myself. If you'd asked me just six months ago I would have told you that I didn't much care for westerns as a genre. I guess I thought that gun fights were tedious or something but I never bothered to dive into the rich catalog of cowboy cinema, being predisposed to space men and talking apes from an early age. I remember that I enjoyed Eastwood's Unforgiven when it came out but that was pretty much the exception to the unconscious rule, "I don't care for westerns" that I adopted somewhere and was dumb enough to carry around all these years. And then a few months back I found myself in the cheap DVD bin at WalMart searching for something new. I figured that I'd hit sci-fi bottom with my last bin purchase (Starship Troopers II) so I was looking for new territory. What I eventually landed on was a set of three Clint Eastwood movies for under $10.00 (High Plains Drifter, Joe Kidd, and Two Mules for Sister Sara). There had to be something good in there, my budget decided. The first thing that I realized when I got home was that I loved western soundtracks. I also liked the idea of wooden towns, and walking around in them with a firearm and a bottle of whiskey. I can't remember how many times I watched High Plains Drifter that night, but it was a lot. And the next day brought more of the same, with occasional breaks to watch Joe Kidd and 2M4SS. In the next few days I got my first John Wayne movie (The Alamo) and finally hit Leone paydirt with The Good, The Bad, and The Ugly. I was a sponge. A gritty, trigger-happy sponge. Besides the language, the stylistic violence, the flirtations with history, the glorification of rotten men, the follicle -counting close-ups, and the thick layer of dust on everything, I think I like the simplicity of the western fantasy world. Need something? Steal it. Trouble with your plan? Shoot at it. In fact, there seems to be nothing wrong in the world that a bottle, a pile of dead folks, and a few sticks of dynamite can't fix. High Plains Drifter, GB&U, Fistful of Dollars, For a Few Dollars More, Unforgiven, High Noon, Once Upon a Time in the West, Joe Kidd, The Alamo, Rio Bravo, and The Magnificent Seven. But watch out... One minute I think I don't like westerns and the next thing I know I have a tiny cardboard western town... and it could happen to you, too. "Behind the Chaps: The Making of Low Plains Drifter"
The Guy With No Name. I turned my back for a second and a few more appeared. Another Big Jack, The Carson Boys, more of the Dirt Family, a rummy old coot, and a cold-blooded gunslinger. You can decided who is who for yourself. with fake fur and Mod Podge! Back on SmBlog Page One I showed off my cardboard western saloon and dreamed about making a vast old west town around it. I imagined it might be called Boxtop Hill, and then I forgot about it shortly afterwards. The Saloon sat on my shelf for many months, 7/8 complete. Then one week about two months ago I happened to watch High Plains Drifter roughly 700 times, and suddenly I woke up and there it was; an entire old west town made out of cardboard! Imagine my surprise. And it wasn't a ghost town either. No sir, in fact some of them Smalls we already had gravitated to the new western frontier motif immediately and required very little alteration to fit in, but more than a few were hatched special for this new play environment. I'm still building and refining the cast and the town (I need an Undertaker!) but I couldn't resist adding some of the new stuff to the Census. Speaking of that, the official Small Census passed the 500 mark! 519!! Yea! This last bit was the frosting on my Cake of Outrage. I have always taken umbrage at directions like, "Enjoy this product!" but there is something profoundly lame about suggesting that people have fun with their toys. Also please keep in mind that shoes go on your feet, and air should pass through your lungs with some degree of regularity. But I guess if you collect unopened playthings and store them in dim vaults, and spend your free time cataloging the crispness of the box corners while dusting them repeatedly, sometimes gently and other times abruptly with the full force of a man, then it's probably good advice. However, it is this kind of thinking that leads to darkly absurd labels like, "Do not put in eye." I did appreciate the tip about using backgrounds or even wild things like accessories to add spice. So out of left field - who would have thought? I love me some spice and I can't wait to start applying this radical theory to my toy vault. I just hope mom remembers to buy more batteries for the flashlights before the next Collector's Club meeting! The first three words of this paragraph contain the only real truth here; Don't be afraid. The rest is ridiculous, but that little part works for me. We keep a spreadsheet of names and ID numbers for the Smalls. We are fast approaching a population of 500, if you must know. I tend to this list like a chimp operating a construction crane, which is to say irregularly and without much concern for the consequences, but I admit to keeping the list and I'm even proud of it sometimes. But I get the feeling that the tipster here is talking about something more like a card catalog where one can record purchase dates and log fluctuations in market value. I think if a visitor here ever asked for that kind of information I'd punch them in the kisser. Younguns, don't be fooled! This is one of the twisted ways people can convince themselves that they are enjoying toys without having to actually touch them, and it is simply wrong. Anyone with a card catalog of their toys needs to torch it, right now. Or better yet, run the hose up to the top of the slide and use those 3x5 cards as sliding mats for your toys on their new Giant Water Slide! A: Dust is not some kind of evil cosmic margarin, looking for an unguarded nook or crany in which to begin its terrible melting rituals. If you have your toys in a vault or any other kind of display case the chances that dust demons will destroy them is pretty slim, and you can always find spells against them in your D&D manuals. B: Cleaning toys is not a gamble, it's just weird. Some seem to think that dust is akin to the Cavity Creeps ("We make HOLES IN TOYS!") when the truth of the matter is that fussing over toy dust is one of the hallmarks of stunted social skills. I happen to be an authority on this one. If your toys need cleaning it should be because you have spent all day with them in the mud, and the solution is obvious: take them into the bath with you! No direct sunlight, fear of fading... are these cave paintings we are talking about? 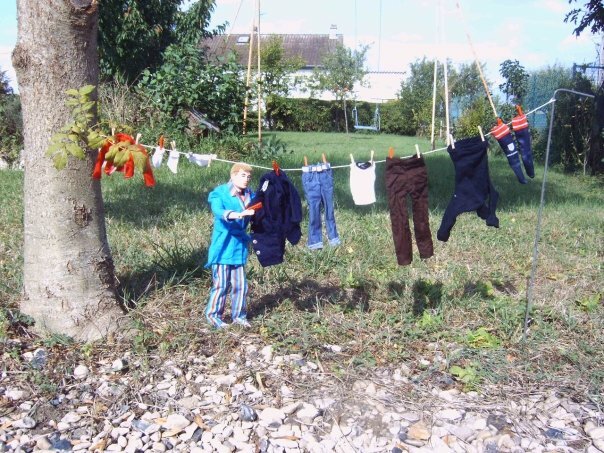 For the love of Marty, if you are afraid to play in the outdoors (where they keep the sun) then you are probably riddled with countless other anxieties and need to spend your money on professional help, not toys. And then we are encouraged to use artificial light to, "aid visitors in actually being able to see what's on display." Is pedantigeek a word? Doesn't mom have some flashlights your friends can use while you are all in the basement? This makes me want to hurl. The United States Constitution needs to be in a temperature controlled environment. So do most reptiles. Toys are playthings intended to inspire something playful in the mind of the dork holding it, and to hold it you have to take it out of the box. Maybe instead of worrying about mysterious things growing inside your coveted toy packages you should go out and ride a roller coaster or something. If there is anything creepy melting your plastic treasures when you come back then you didn't clap hard enough, and Tinker Bell is dead. Nothing screams, "REJECT ME!" louder than opening with a stupid assumption. Everyone does NOT want their toy collections to look good. Parts of ours look ghastly and we have selected that aesthetic. Our graveyard monsters have their own living bugs inside them, for instance. We have a gang of Batman Brothers who live under what you would probably (after a lengthy pause) describe as "display shelves" where they collect dust, dog hair, cobwebs, germs, and who knows what else. We have even intentionally and with malice aforethought littered our toy Carnival with tiny trash, because it looks great. As far as having space to display your toys, how about in a giant pile on top of your bed? For extra points, don't make the bed! I simply cannot let this kind of thing stand. I try to be nice and excuse myself from controversy, I hold my tongue when I can, but everyone has a breaking point. Plus, I haven't had anything to write about in ages and the keyboard was dusty. On page 59 of the Nov. 2007 issue of (a modern toy magazine) there appeared a gray box in the top right corner, under the banner FYI Display Tips. Inside this box were six fluffy paragraphs that neatly illustrated what is wrong with toys in our modern world, and the blockheads who collect them. I see things in certain toy-related magazines and I read reviews on notable toy-related web sites, and all I have to say is BLECHK! Anyway, I decided that I was sufficiently appalled by the nonsense in that gray box to hack it to pieces in public, one paragraph at a time. You can witness the complete horror for yourself HERE, but I'm going to post my stinging review of FYI Display Tips in short bursts over the next week or so. This is an ancient journalistic method known as Milking the Rat. Ok so like wow; Page Four. It really makes you think, huh? I picked this motto because it includes all of the modern marketing food groups. I like the brevity and exuberance of it, and since visits to web pages are called "hits" I found it very funny, indeed. And at the end of the day that's what wins contests around here. Make me laugh - get a poster. That's the rule. So congratulations to George and his Emerald Sisters! We'll get your T19 Poster in the mail pretty darn soon!